A celebration of music, light and ideas could put the city on the cultural cutting edge. The Grand Prix won’t be coming back to the Inner Harbor in 2014, and some are not sad to see it go. The event, with its barricades, noise and pollution, did not strike everyone as the way to move Baltimore into the future and bring people together. Brooke Hall, Justin Allen and Lindsey Davis think they have a better idea, one with the potential to propel Baltimore to the forefront of culturally innovative places. They want to cast the city in a positive light – literally. Over the last decade or so, cities in Europe, Asia and Australia (but so far, not the United States) have drawn huge crowds and garnered international attention by staging “light festivals.” These multi-day events feature large-scale illuminated installations, displays and other works of art, along with a variety of related activities. It’s an idea that Davis, Hall and Allen, working as the Light City Team, believe Baltimore should embrace and make its own. Baltimore already has a handful of annual extravaganzas that draw big crowds, such as the Preakness and Artscape, and it has had success with one-off events like Sailabration in 2012. The Light City Team envisions something more ambitious: a recurring festival lasting up to a week or longer that would focus on raising the city’s profile as a hub for creativity and technology. Satellite events might include a music festival and a conference on innovation. It could give a big boost the local economy; cities in France and Germany have drawn millions annually to their light festivals. 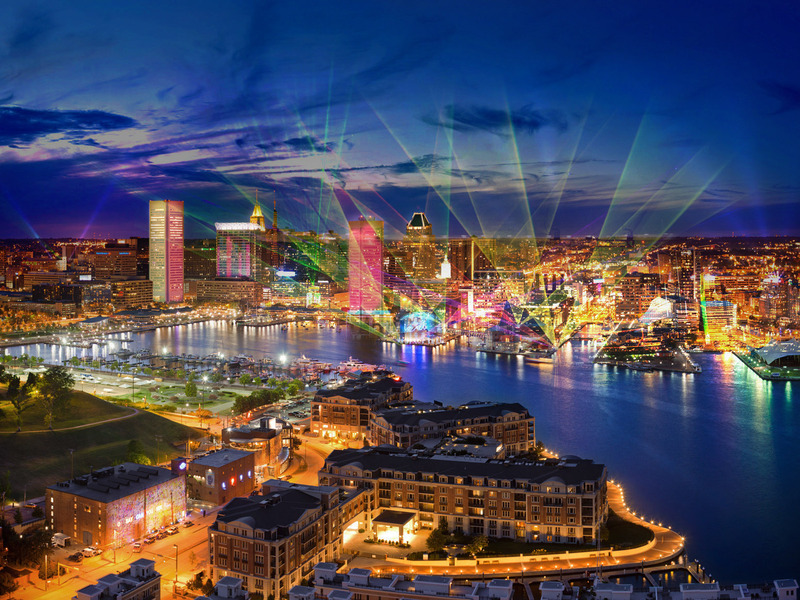 The organizers are especially looking to Australia’s Vivid Sydney event as a model – a fitting tribute, as the redevelopment of that city’s waterfront was influenced by Baltimore’s Inner Harbor. A light festival based in and around the harbor would showcase Baltimore’s artists, performers and thinkers – what Allen, himself a musician, calls “one of the densest populations of creative people” anywhere – as well as bringing in talent and spectators from around the country. Visitors would be encouraged to interact with the artwork and each other. The Light City Team members have long been bullish on Baltimore. Hall and Allen, who are married and live in Mount Vernon, are the founders of What Weekly, an online source for local news and entertainment that emphasizes the positive. Davis, a project coordinator with a local architecture firm, wants to use her creative vision to benefit the city that, growing up in Pikesville, she thought of as “a scary place” but now calls home. The most important aspect of their plan, according to the Light City Team, is what it could do for the city’s battered image. “Our reputation is the pits,” Davis says, thanks in no small part to media and entertainment portrayals like “The Wire” that focus on the city’s seamier side. “This is exactly what Baltimore needs,” Hall says.